Click to enlarge. Eaton School, April 2009, prior to any work being done. 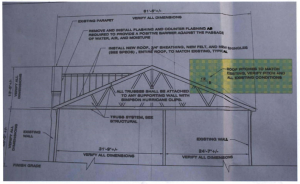 When reading this please note – the contractor has been paid $86,000, which was 100% of the original bid and the architect has been paid $13,500 for roof plans and interior diagrams. A project which should have been a straight forward replacement of an existing roof turned into a complete and utter debacle of historic proportions. The calamity of errors now leaves an African-American national landmark on the city’s demolition list, cost to taxpayers of over $100,000, and $754,000 in structural damage according to Neel Schaeffer and Associates. 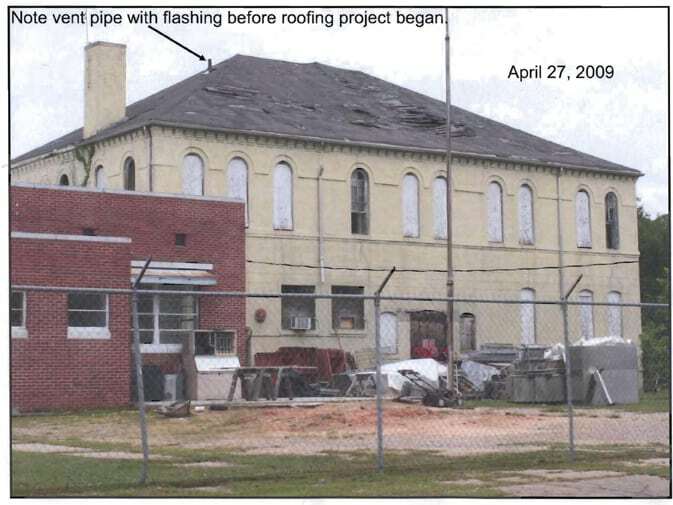 The one single requirement for the project to receive matching federal funding through the Mississippi Department of Archives and History was that the new roof pitch must match the existing roof pitch. 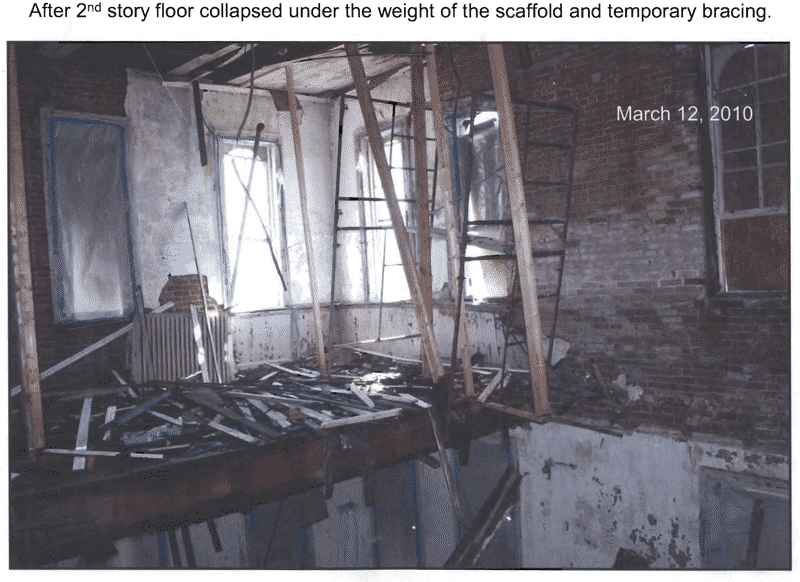 It took three roofs and five months (November 2009 to March 2010) to get it right; before an inadequately supported second floor, weakened from months of exposure to rain and snow; supporting heavy scaffolding, collapsed leaving the building in ruins. (Click to enlarge) The letter of recommendation from Don McCleskey to the city, endorsing J. Miller Roofing. J. Miller Roofing’s incompetence destroyed the National Landmark. 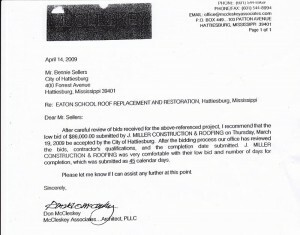 McCleskey, the architect who prepared the bid, drew the plans, and recommended the contractor, told the Hattiesburg Patriot that his recommendation of J. Miller roofing was “routine.” McCleskey explained that since J. Miller Roofing was the “low bidder”, and the company was licensed and bonded; he recommended them for the job. When reminded that the bid stated “lowest and best bid”; not just the “lowest bid”, McCleskey went on to explain that hiring someone who was not the lowest bidder might file a discrimination based and/or other litigation; which could tie a project up for months or years in court. McCleskey reiterated that recommending the lowest bidder was routine for him in order to avoid the potential litigation gambit. The original intent of McCleskey and Public Works Director Bennie Sellers was to partially replace the roof support system by scabbing onto existing members for added strength, only replacing the roof members beyond repair. It was decided in a meeting between McCleskey and Sellers that rather than bid the project as a rehab and replacement, it would be a full replacement. The concern at that time was once the project started for a partial replacement, further discovery might lead to additional work above and beyond the initial project scope, and result in multiple change orders from the contractor. When the project began, J.Miller Roofing removed the entire roof and made an attempt to get measurements of the roof pitch on the ground, using the old framing members as a pattern, but disturbing the original position of the roof members made it impossible to get a verifiable pitch, and results were highly inconsistent. Furthermore, Mr. Miller lacked the skills needed for such a project, and he actually needed hands on supervision by the Architect who recommended him. 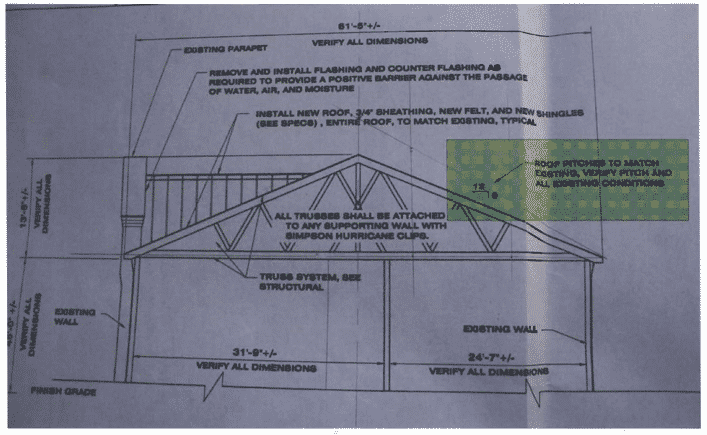 Miller ultimately decided that the architect’s estimation of the roof pitch would suffice; and so the 5/12 truss system was ordered by J. Miller Roofing and installation began in early November 2009. 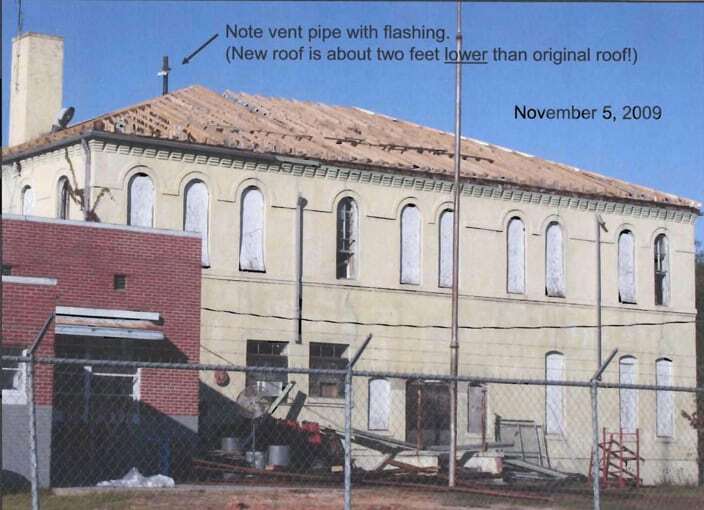 On November 5th 2009 (see timeline), Jeff Rosenberg, with Mississippi Department of Archives and history visited the site and easily recognized that the roof was not the original pitch, but instead much too low. The photo below and to the right shows where the original roof line met the flashing at the vent pipe. A few days later Hurricane Ida came through and poured rainwater into the building. Click to enlarge. After the 5:12 pitch was installed it was clear that the roof pitch was entirely off the mark. Rosenberg called Brian Jones with McCleskey Associates Architects and informed him of the incorrect pitch. Jones asked Rosenberg if an 8:12 pitch would be acceptable. Rosenberg replied that “the only approved pitch is the original one.” (Click Here to See MDAH’s Timeline). Rosenberg then asked Jones how they arrived at an 8:12 pitch. 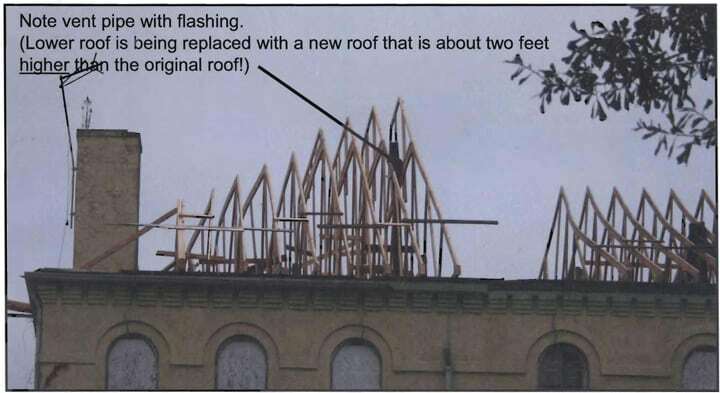 Jones responded, “per Don McCleskey’s conversation with the truss manufacturer, the roof pitch was measured from the height of the vent stack.” Once the trusses arrived J. Miller Roofing began installation of the 8/12 pitch. 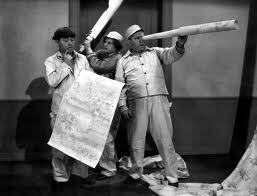 Pictured above are Don McCleskey (looking through tube) with Johnny Miller of J. Miller roofing (left) seen holding McCleskey’s “plans” While Ken P’Pool with the Mississippi Department of Archives & History (rear) prepares to clonk them on the heads. Jeff Rosenberg,with Mississippi Department of Archives and History, made a site visit and photographically documented that the pitch of the second roof (8/12 pitch) was approximately two feet higher than the original, historic roof pitch; therefore, and once again, did not comply with the project’s only historic requirement. (See picture below and to the right) Rosenberg then contacted Brian Jones of McCleskey Architects and Brett Benson, the city’s grant coordinator, on December 4th. They all concurred that the pitch of the second set of trusses once again didn’t restore the original pitch and didn’t meet project requirements. Rosenberg then arranged an on-site meeting on December 9, 2009, which included representatives from (Mississippi Department of Archives and History, the city’s representative, Tim Pittman, the architect, the contractor, and himself.) Rosenberg then climbed on the roof and actually measured the pitch of original roof, using the surviving marks from the chimney and vent stack, as well as several original roof framing members that were still on the work site. With the original roof already removed, it was no easy task, but Rosenberg determined to the best of his ability, given what was left, that the pitch to be very close to 6:12, and the trusses were ordered and installation began. The second floor was severely weakened having been open to the elements for months, and both rain and snow had freely entered the structure. Workers were climbing scaffolding, and loading the roof with decking, when the building shook like an earthquake. The second floor of the building, the floor open to the sky and elements for nearly five months gave way. Eaton School, a national landmark is lost. “The contractor twice installed roof trusses that did not comply with the plans and specs; he left the building totally uncovered during the months of greatest precipitation; and he placed heavy scaffolding on the second floor for an extended period of time. This combination of factors caused the collapse of a portion of the second floor, which produced a major structural crack in the building. No one admitted any fault in the project. Because the contractor failed to follow the project plans and specifications, the school building was left entirely open and exposed to the elements from October through March. During that period there were several heavy rains and a significant snowfall that likely accelerated the deterioration. 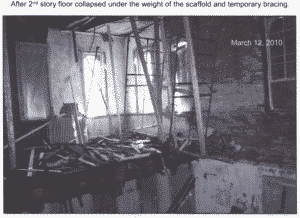 The added weight of the contractor’s scaffold installed in the southeast room of the second story, as well as that of the temporary bracing for the second floor ceiling, undoubtedly led to the second floor’s collapse, which, in turn, allegedly rendered the building structurally too unsound for completion of the roofing project. Had the contractor properly fulfilled his contract obligations, the roofing project would have been completed in November 2009 without problems and the building would be in sound condition. Even with his mishaps in constructing a roof of proper pitch, had the contractor properly supported his construction loads at the first floor level, the second story floor would not have collapsed. The City should investigate seeking damages from the contractor’s bonding company. 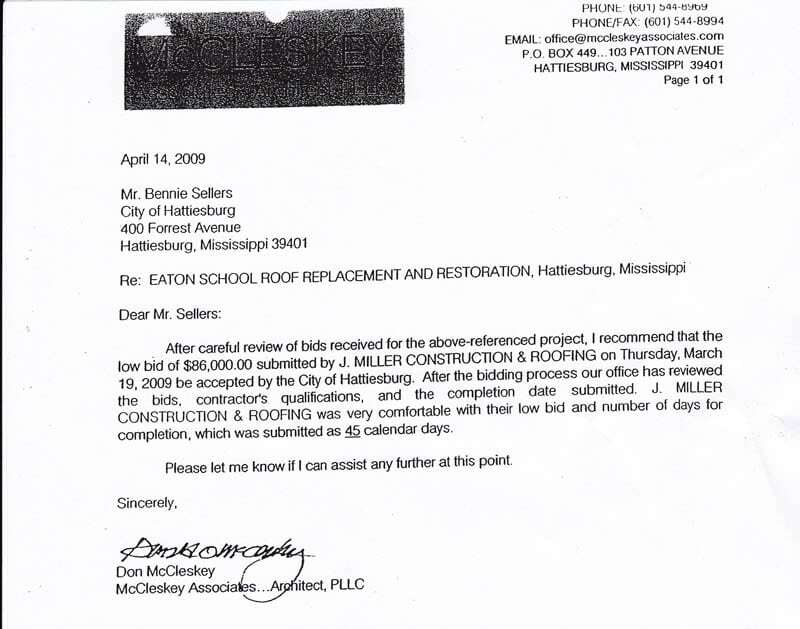 The Hattiesburg Patriot alleges that the Don McCleskey was negligent in his recommendation of J. Miller Roofing and might have possibly crossed some ethical boundaries when he and Bennie Sellers assisted J. Miller Roofing with completing their application for payment. 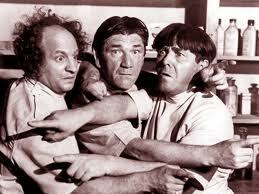 Furthermore, that should have been a red flag to be more involved in the project. Clearly the contractor was not competent for this type of construction job. To date, no legal action has been taken by the city to pursue the contractor’s bond, which would likely only cover the cost of the roof and not the repairs on the building. It is also our opinion that Don McCleskey should return all monies he received as payment for this project. Taxpayers should call 601-545-4500, ask to speak to the mayor and demand action. The Mayor is presently doing absolutely nothing to recover these losses from his administration’s failed project. Please support our efforts and give a donation of $10.00. This investigation took months and required many records request and interviews.